First Aid - Do you need first aid help/info NOW? "HELP, WHAT DO I DO?" "I can't remember First Aid!" Have you been in a position where you needed to do first aid? Have you ever found a child, friend, workmate or even a stranger who has had an accident and you're the first on the scene? We want to give you access to first aid procedures and guidelines, including performing CPR, treating bleeding and severe bleeding, minor and major burns, fractures as well as shock. Accurate Instructions are so vital as it is the person on the spot, not a doctor or ambulance officer, that will clear a blocked airway and do CPR, stop bleeding or assist someone injured to become safe. Then there are the more common issues of nosebleeds, sunburn, cuts, bites, stings and the like. Maybe you are putting together a First Aid Kit and you're not sure where to start. 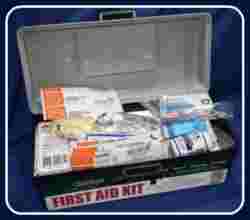 We have First Aid Kit Checklists ranging from Basic Kits to Vehicle and Motorcycle Kits. When you are heading off on an adventure you will need a tailored kit, you may be going Boating or out on the water, Hiking, Backpacking or off into the Wilderness. We have lists and suggestions for all sorts of kits. If you find this web site useful bookmark it, or put it in your favourites, as we want this relevant emergency medical information to be only a click away then you will not be scrambling for it in the heat of the moment when immediate attention can be so vital.